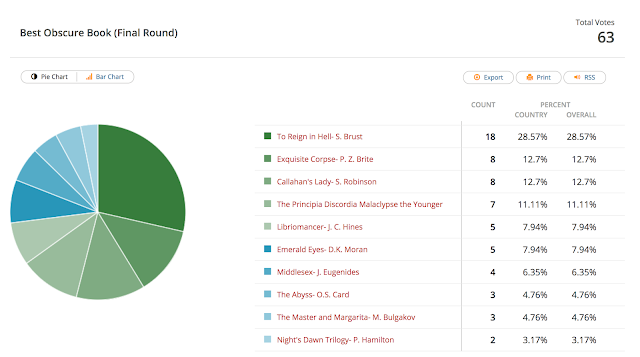 Thank you everyone for participating in December's "Best Book That No One Seems to Have Heard Of" poll. I know it was a little weird for a poll, given the irony that the fewer people had heard of it, the worse it would do. But I hope everyone got some good books for their To Be Read list–maybe that they hadn't even heard of. I tried to wait for some of the ties to get a definite winner, but for every one that went away, another showed up somewhere else on the poll. I will make sure that our next poll is a little more traditional. Perhaps a redux from the early days of the blog–now that we have more readers. On that note, stay tuned. It will probably be up a little later today. The Irishman's Journey to Montana.....Best obscure book!